The iconic views of mountains and foliage of Jackson Hole in fall is matched by the magnificent wildlife. The herds of elk and bison roam the Valley floor in a steady and predictable rhythm in and around the time of their rutting season. Catching one of these stately creatures in isolation is awesome. This bison bull apparently ready for winter – fattened up with a full coat – was willing to stand briefly for a portrait. 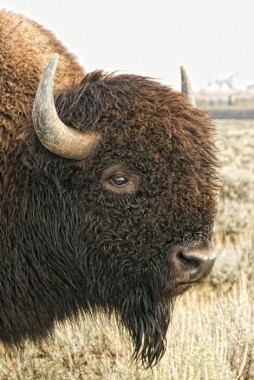 It hard to believe, but this well-groomed bison is wild and doesn’t have a hair stylist.